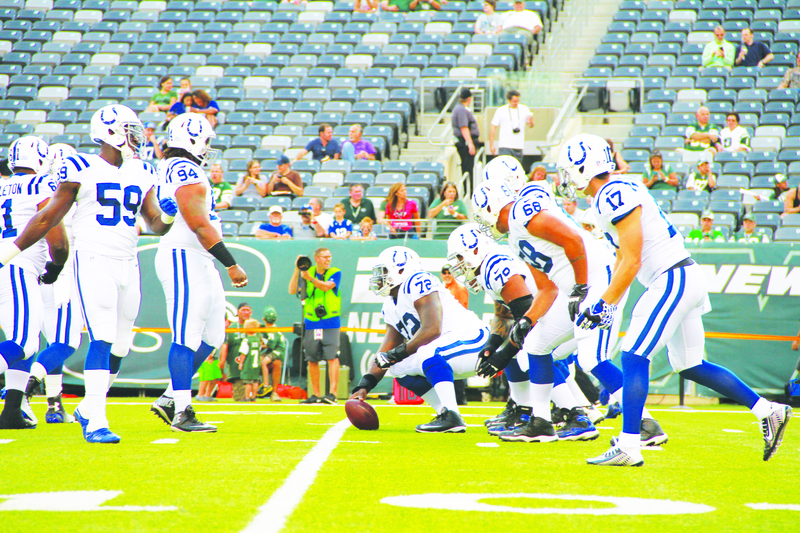 The Indianapolis Colts warm up on Thursday before their preseason opener against the New York Jets at MetLife Stadium. By the kickoff of the Jets’ first preseason game on Thursday against the Indianapolis Colts, it was no secret that the starting quarterback job was Geno Smith’s to lose. But it was second-string quarterback Michael Vick who ended up stealing the show. In his only series with the first-string Jets’ offense, Vick led the team on an 80-yard drive downfield, culminating with a touchdown by running back Chris Johnson. The Jets ultimately won 13-10 on the strength of a late fourth quarter field goal by backup kicker Andrew Furney. For months, there was the looming question of whether coach Rex Ryan would tap Smith or Vick to pilot the Jets, who ended the 2013 season with a respectable 8-8 record. Some argued that after Smith’s uneven performance last year, the team would benefit from the 34-year-old Vick’s veteran touch. But not long after training camp began this summer, Ryan started to hint that Smith, a 2013 second-round draft pick from West Virginia, would be his starter. Both quarterbacks have had their issues. Vick suffered from injuries and uneven play last year with the Philadelphia Eagles, where he was quickly ousted from the first string by unexpected phenom Nick Foles. Smith, on the other hand, showed himself to be both immensely talented and frustratingly inconsistent in 2013, throwing 12 touchdowns and 21 interceptions, while also rushing for six touchdowns. Notwithstanding Vick’s strong showing, Smith put in a solid performance on Thursday, completing four of six passes for 33 yards. Still, he sometimes seemed nervous and hesitant, throwing a nearly intercepted pass during his first series. Ryan said he was happy with the performances of both quarterbacks. But it was clear on Thursday that Vick was the fan favorite. The crowd roared when he stepped on the field in the beginning of the second quarter. The air felt different. Vick’s stride had an obvious confidence that drove his fans wild. Next week, Smith and Vick will take their rivalry on the road, facing off against the Bengals in Cincinnati. This entry was posted in Sports and tagged Indianapolis Colts, New York Jets, Preseason, SJP2014 on August 11, 2014 by pusjp.